When we moved to the Sunshine Coast some years ago, we decided to make the most of our time here and see as much of Queensland as possible. Well, so far that hasn’t quite worked out. We haven’t even explored all five islands close to us: North & South Stradbroke Island, Moreton Island, Bribie Island and Fraser Island. After five years, we’ve only managed a long weekend camping trip to Bribie, followed by a week on Fraser Island over Christmas. I’m keen to add Moreton to my island list next year! If you’re looking for a day trip from Brisbane or a weekend away, Bribie Island is perfect. 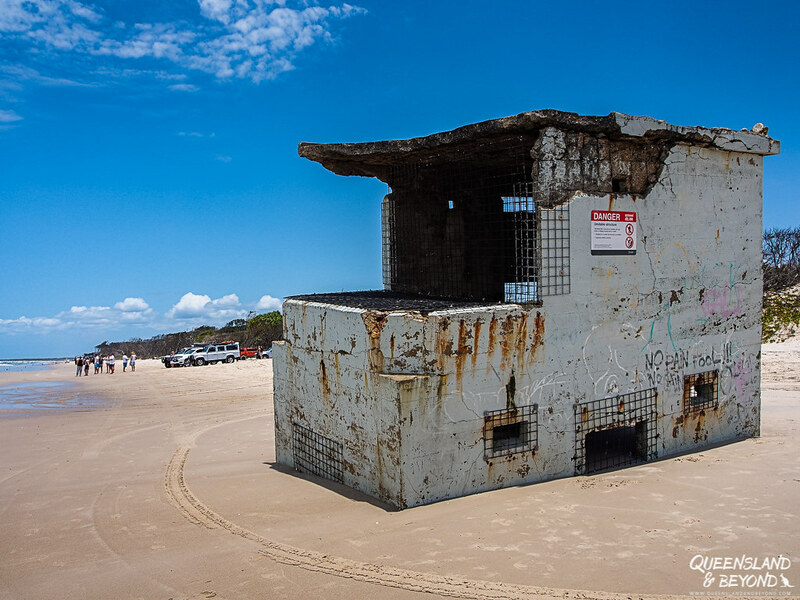 For me, the main attraction is Bribie Island National Park but to explore that, you will need a 4WD vehicle, or at the very least a soft roader. Bribie Island National Park is so close from the Sunshine Coast that you can just spend a day there if camping isn’t your cup of tea. And though it’s an island, you won’t need to take a ferry (yay! ), bringing a) the cost of your trip down, and b) no nasty seasickness for me. Halfway between Brisbane and the Sunshine Coast, Bribie is super easy to find. Take the Bruce Highway (M1) to the turnoff for Bribie Island Road (State Route 85), just south of Caboolture. From the turnoff, it’s only about 30km to Bribie. Cross the Pumicestone Passage Bridge, take Goodwin Drive at the 2nd roundabout, and follow Goodwin Drive onto First Avenue. You’ll end up in the tiny town of Woorim, where you can do some last minute grocery shopping if you need to. First Avenue turns left and becomes North Street, which eventually takes you into the national park. It’s all signed so should be pretty easy to find. And Bribie Island isn’t that big, even if you get lost on the way. Exploring Bribie is all about beach driving on Ocean Beach. It still boggles my mind that this can be done so easily in Queensland. Make sure you’ve organised a vehicle access permit from Queensland National Parks beforehand. You can’t buy one at the national park (in person, I mean) but it’s easily done online or by phone. A Bribie Island 4WD permit will set you back about $50 and is valid for one week. If you’re keen to explore Bribie for longer and want to come more often, buy an annual one. It’s much cheaper, if you come multiple times (about $155). The other thing you need is obviously a high-clearance 4WD vehicle. People also come along in soft roaders (all-wheel-drive vehicle) but be prepared to get bogged if the sand is particularly hot and dry on Ocean Beach, or along the inland tracks. Some experience driving in soft sand definitely wouldn’t go amiss on Bribie. Unlike driving on Teewah Beach in Great Sandy National Park near Noosa or on 70 Mile Beach at Fraser Island, Ocean Beach at Bribie has very soft sand. At the entrance to the national park is a good spot where you can let your tyres down. 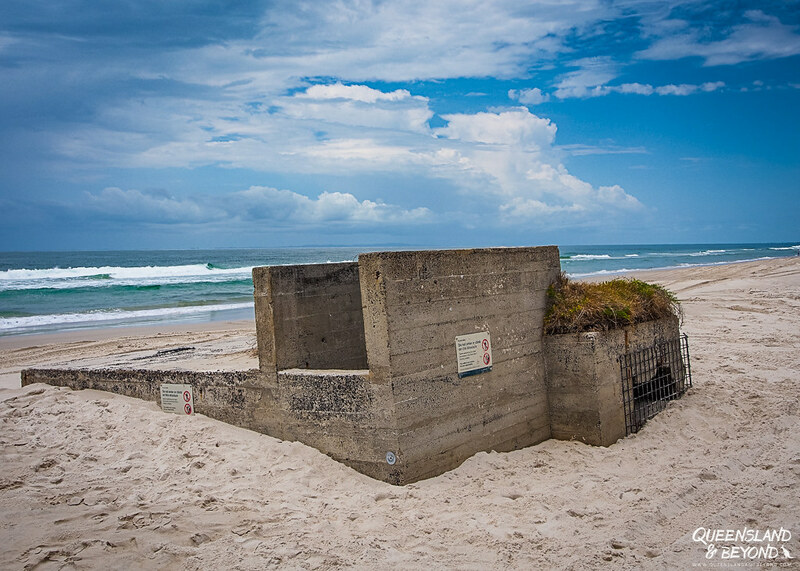 We’ve been on other beaches in Queensland where lowering air pressure wasn’t as necessary but at Bribie, you’ll want to do that or you’ll get bogged just entering the beach. And don’t forget to lock your hubs. Beach driving is a bit like driving on ice – the car doesn’t quite behave in the same ways as you may expect. So don’t go crazy and drive like a maniac. Have a look at tidal charts to work out the best times to enter Ocean Beach. We didn’t have any issues driving on the beach even as the tide was coming in but avoid driving at high tide as you’ll end up in the more sandy banks. Or in fact, you may not have any beach at all. On our first day, the driving was pretty smooth and only a little bit squishy. The next day, after having done a loop around the island in the early afternoon and coming back onto the beach a little too late in the day, high tide was rolling in full-steam. As a result, the driving was bumpy and much less pleasant. I think I hit my head at least twice so let’s just say that I was very glad when we finally arrived back at our campsite. Part of me thinks it all fun but the other part also has a bit of an issue with beach driving given the environmental impact. So if you can avoid the higher sections of the beach and/or high tide, do. There’s also some traffic to manage on weekends and during summer holidays (stay on the left! ), which is not surprising given how popular Bribie Island is for day trips and weekend camping. Honestly, I don’t think there’s a ton to do on Bribie Island. Yes, I could make a super long list of random things here, like feel the squishy sand under your feet but I find that just daft. Instead, I’ve tried to come up with a few more meaningful ideas on what to do on Bribie Island. Ok, this one’s totally obvious. I like camping, and Bribie is made for camping. There are three 4WD-accessible camping areas on Bribie where you can pitch your tent. We booked a site in the Ocean Beach camping area, hoping that this would mean few mosquitoes (how wrong we were…). To get to the Ocean Beach camping area, it’s a couple or so kilometres from the national park entrance and then some 20km along the beach. 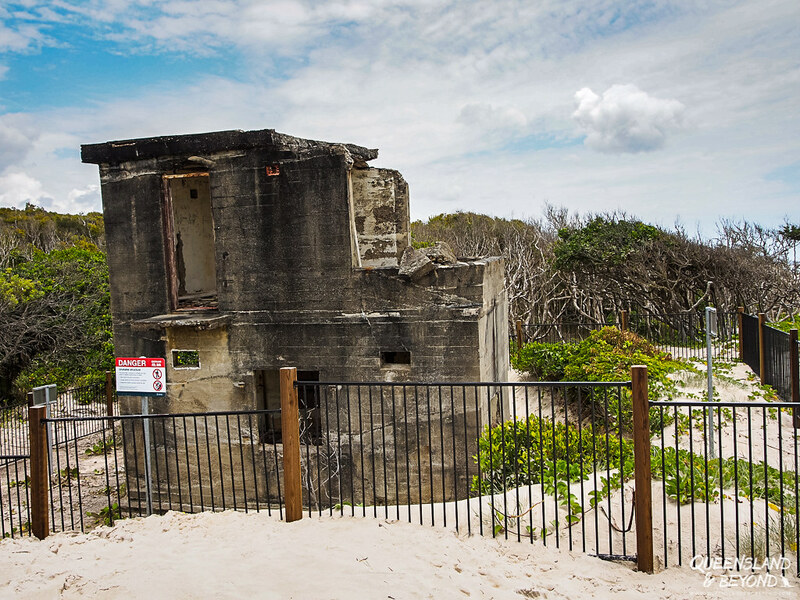 Even though there isn’t all that much to do on Bribie Island, one thing that is really cool is the few historical remnants of a time gone by. 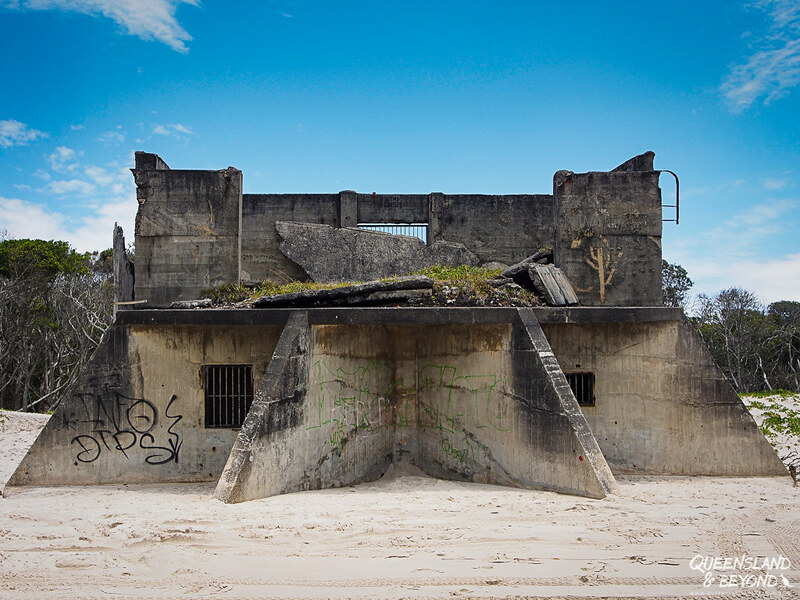 During the height of World War II, Fort Bribie was built at the northern end of the island within less than a year. 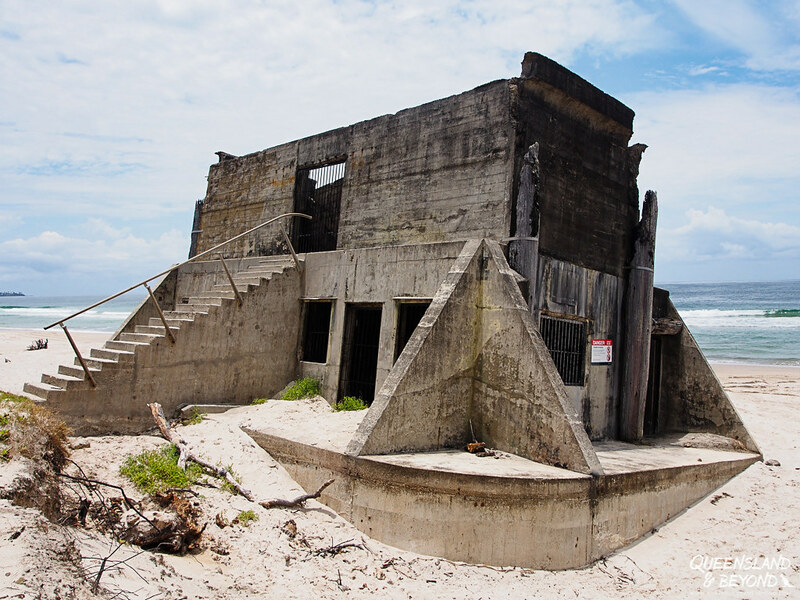 Weathered gun emplacements and ruins of searchlight buildings along Ocean Beach are all that’s now left of this World War II defense outpost. 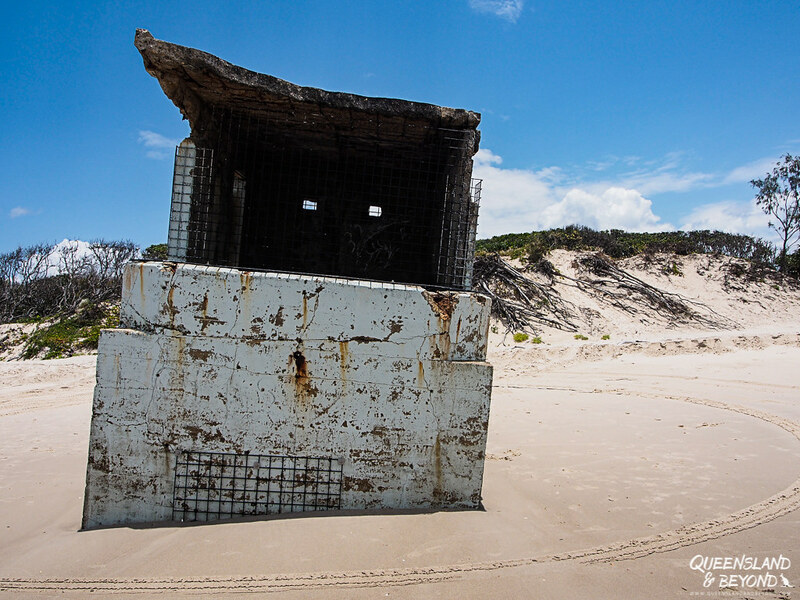 Most remaining defense structures are fenced off as they’ve become very unstable due to shifting sand. 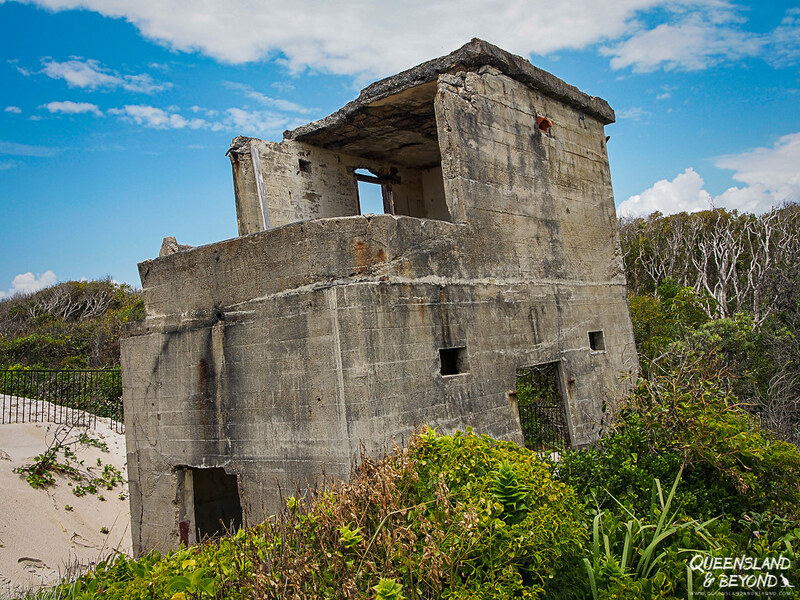 You can still wander around though, and incredulously imagine how much people must have feared a Japanese or German invasion to build a fort here in 1941. The Northern Searchlight also marks the end of the beach vehicle access. From here you can walk to the northern tip of Bribie but not drive. Swimming in the ocean off Bribie Island isn’t really a safe thing to do. There’s strong currents and rips, and you don’t want to be swept out by the tide. There’s no patrolled beach in the national park so unless you’re a surfer or really know what you’re doing, I wouldn’t recommend it. But it also gets pretty hot so your only option for cooling down is to jump into one of the four lagoons. Like beaches, the lagoons constantly change. With rainfalls, they get bigger, or if you come in winter, you might not find much of a swimming hole to plonk your feet into. When we were there in November one year, I couldn’t find 4th lagoon at all. Throughout summer, and if they’re carrying a bit of (inviting) water, you’ll probably find the lagoons to be very busy. People will set up gazebos and sunshades between cars, and hang out there for the day. Norfolk Creek and Second Lagoon along Ocean Beach: The only really pretty (and very popular) lagoon. But on a Monday, it was just us and the lagoon. But if you come during the week outside school holidays, you may just have it to yourself. I’m not much of a water person (yet) but paddling around the Pumicestone Passage is pretty popular. Yes, you could also do this from Caloundra or Golden Beach but if you’re camping at Poverty Creek on Bribie, kayaking or SUPing would be a fun thing to do, I reckon! Bribie Island doesn’t offer heaps in terms of hiking. Well, you could spend your day walking up and down Ocean Beach but it’s not the most exciting activity. But there are two short walks on Bribie, and I haven’t done either yet. The Bicentennial Bushwalk is an easy 3.8km return walk, and takes you through bush, shrubs and heathland. Apparently it’s wonderful for birdwatching. And you won’t even need a 4WD as you access the walk from sealed Sunderland Drive close to town. It’s pretty easy to spot some wildlife in Australia once you leave the urban areas (and even then it can be pretty easy). Bribie is no exception, and if you just hang around for a while, you’ll see all sorts of animals come past. I pretty much saw kangaroos every time I walked to the toilet block. Oh, and goannas. Wallabies are also keen to hang out in the shrubs just behind the dunes. On the beach, there were blue blubbers all around. And during stinger season (summer) bluebottles can be found even as far south as Bribie Island. Be careful, they can give nasty stings and leave scars (I speak from experience). Just meandering along the beach, we saw a fair few birds of prey, including a couple of sea eagles. I expect in winter, you would also be able to see whales though how close they come to the shore, I’m not sure. 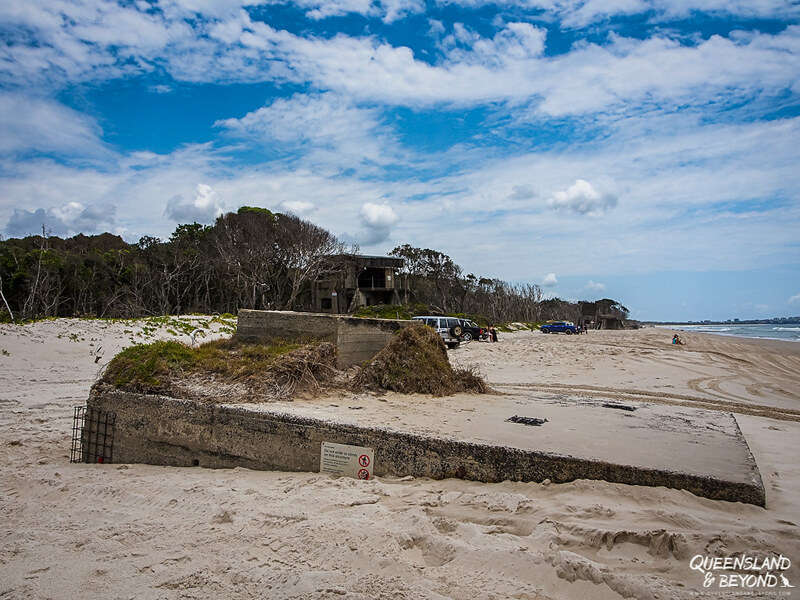 After we had a look at sinking Fort Bribie, we took the Bribie Island Northern Access Track just to see where it was going, and came back to our campsite via the by-then-bumpy beach ‘road’. To be honest, it wasn’t the most exciting drive we’ve ever done as most of the inland track is lined by pine plantations. It just gets a little repetitive after a while. On the other hand, you get that sense of accomplishment – or maybe only I’m so nuts as to count this as an accomplishment! 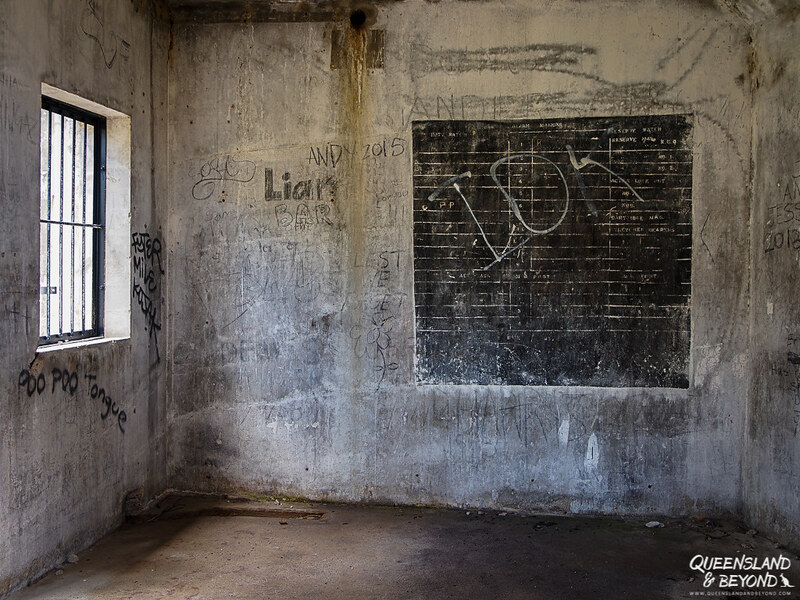 – and feel like you’ve ‘seen’ the whole island and national park now. We pulled into the Poverty Creek campground for a quick picnic lunch. Whilst the campground area is pretty open and doesn’t afford much privacy, there seemed to be far fewer mozzies around! Whilst Ocean Beach on Bribie Island didn’t wow me, it’s a nice long stretch of soft white sandy beach, typical of southeast Queensland. With blue sky, it almost looked picturesque, especially looking towards the northern, curvy end and Caloundra on the Sunshine Coast. For ideas on where to do (beach) camping at Bribie Island, check my review on Section P at Ocean Beach and other camping alternatives. For more information about driving in the sand on Ocean Beach, vehicle access permits or to get a Bribie Island map, check Queensland Parks and Forests: Bribie Island. If you’re not sure where to camp on Bribie, I’ve got a review on beach camping on Bribie for you. 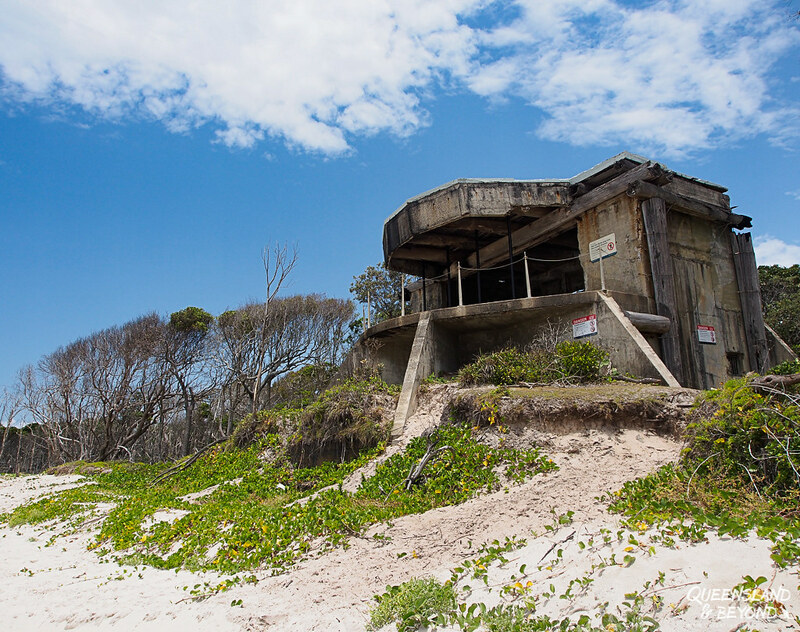 Keen to do more 4WD beach driving, here’s how to spend a few days on popular Fraser Island. Or take a drive along Rainbow Beach and see the amazing coloured cliffs!